Bright, spacious, furnished studio apartment on the 9. floor of a brick building with an elevator in a very desired location in Prague 3 - Žižkov. The kitchen is equipped with a fridge, dishwasher and microwave. Modern bathroom with a shower, wash-basin and toilet. Cellar is available. Laminated floors and tiles. Internet connection is available. Nice view to the park. 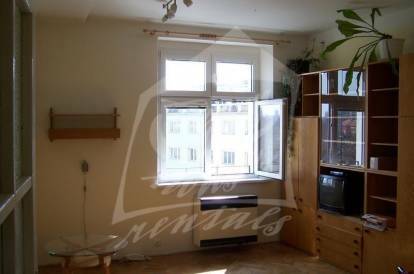 Nearby is a pharmacy, post office, shopping center Flora and University of Jan Amos Comenius. Tram stop "Olšanská" is 1 minute walk from the house, metro stations A "Flora" and "Želivského" are both 13 minute walk from the house. Utility fees are billed separately, security deposit equals to one months rent with utilities. Energy Performance Certificate is not available, so it is described as class G.
Interested in this property, ID 35294?